To make my lilypad-shaped fascinator, I started off by picking out a remnant of celery-green fabric from my stash– it’s satin on one side and dupioni-ish on the other, and I’d originally bought it to line my Regency ribbon-rose reticule. I thought it would coordinate well with my suit– however, once I actually got it out it was clearly too pale a green to stand out next to the bright turquoise suit. I decided to try dyeing it with Jacquard Dye-Na-Flow, which is my go-to for tiny dye jobs like this since it works on both natural and synthetic fibers. I did a few test swatches and ended up using a combination of Turquoise and Chartreuse in a 3:1 ratio. Because my fabric was super-non-absorbent (seriously, water and dye just beaded up on its surface) I had to soak it in water for a good long time to get it wet, and then painted the undiluted dye directly onto the dampened fabric. The dye still wouldn’t spread naturally, so I ended up rubbing dyed parts of the fabric onto the un-dyed parts to get it to distribute evenly. It was a hassle, but the finished shade was a nice springy green. So to go with my 1915 picnic dress, I needed a hat to shade my delicate complexion from the sun (or something like that). I tried using my flowered Edwardian hat but it seemed too elaborate for the relatively casual dress, so I went looking for something new. Since it’s summer there are plenty of straw hats available, but most of them are pretty floppy and that wasn’t what I was going for. I thought I’d start with something more boater-shaped, but apparently I was cutting it a bit close time-wise because most of the cheap boater options online had a 2-3 week shipping time, which was too late for my upcoming picnic. I ended up with a costume gondolier hat, which is coarser straw than I would’ve liked, but it looked about right. Many purchasers complained that the crown was too shallow and the head circumference was too big, making it sit oddly on the head, but one reviewer (a woman after my own heart) noted that it was perfect for puffy Victorian/Edwardian hairstyles, which I thought made it worth a try. One problem with the glass walls of the fairy house is that they really don’t provide much purchase for mounting things like curtains, shelves, or other things. Not only that, but anything you do use to mount stuff will show through the glass from the outside, which is never pretty. To combat this (and to fill in some of the bareness of the walls), I decided to add a tree to the inside. The branches “grow” along the walls and provide both cover and a place to hang things from, and the leaves make the whole thing look cozier and less stark. My daughter is going to be a flower girl in my brother’s upcoming wedding– she’s extremely excited about it, of course! We decided that aside from the dress (which is huge and made of yards and yards of ivory tulle), what she really needed was a wreath of flowers for her hair. Because hey, flower girls need flowers, right? I can never let well enough alone, it seems, and so while I had a perfectly serviceable tabard I knew I’d need something to make it more visually interesting– more “royal,” in other words. As usual, a simple idea (adding silver trim to the hems) quickly ballooned out of control with the idea of getting several different kinds of silver iron-on trims and constructing a faux chain of office to go across the chest, and it wasn’t until I discovered that my chosen trim was unavailable in silver AND realized that it was probably not a good idea to count on ironing velvet (risk of crushing), that I came back down to a relatively sensible level of planning and decided to just make a real chain of office for my husband to wear over his tabard. Yeah, you read that right. 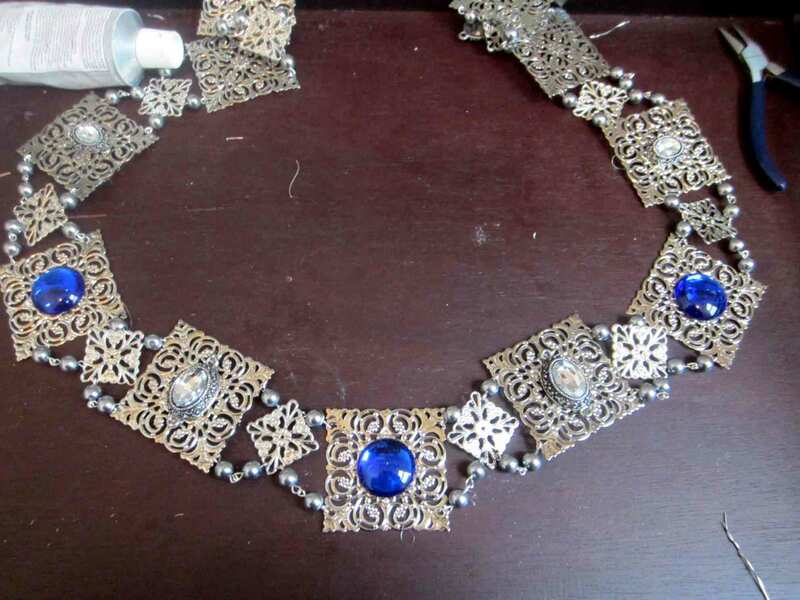 For some reason I thought that constructing a chain of office– which would eventually require several dozen metal bits and pieces, rhinestones, epoxies, and a few different kinds of pliers– would be the more sensible route. To take a brief break from sewing, the first accessory I purchased for this outfit was a no-brainer*: the Lost Diadem of Ravenclaw. I’d considered making my own without being shackled to the movie version, but let’s face it, the movie version is actually reasonably attractive and at $9.99 for an eBay knockoff there’s no way I’d be able to make something equally nice for as little money. So I ordered it, and figured that I could remove some of the larger dangly jewels if they turned out to look too hokey. I was trying to figure out fun poses for pictures in the Ursula/Vanessa dress, and decided to make an extra prop to use– the butterfly sphere. 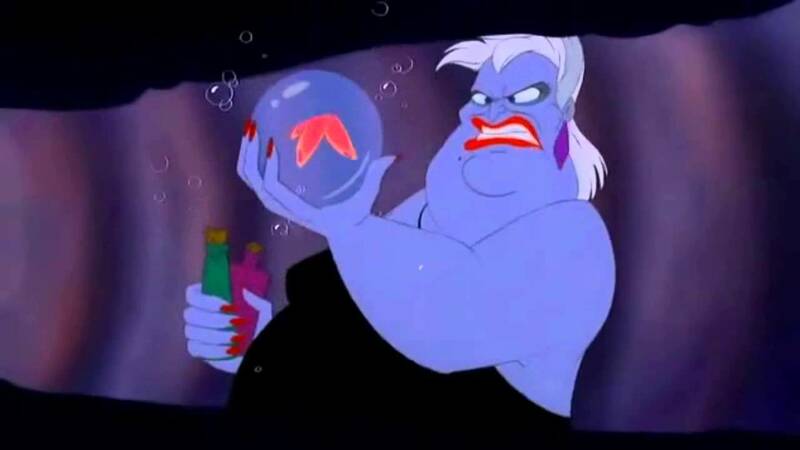 Okay, so maybe you don’t instantly recognize the reference, but in the movie, when Ursula decides to “take matters into her own tentacles” and transform into Vanessa, one of the things she puts into her transformation potion is a bubble with a live butterfly in it. I remembered that I already had some clear glass Christmas ornaments, and thought they’d be perfect for this application. 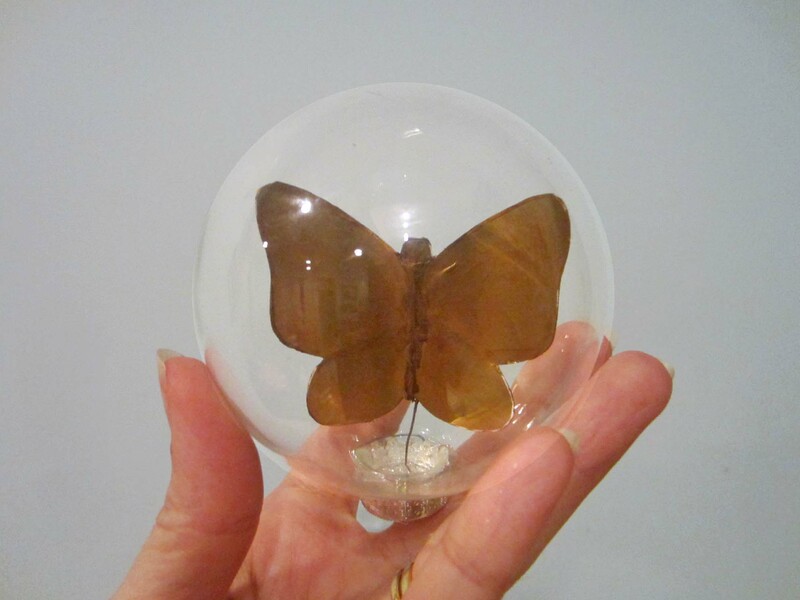 At first I tried to use a 3″ feather butterfly that I had in my craft closet, but the wings were too rigid and it fell apart as I tried to cram it into the top opening. Instead, I decided to use some gold paper to make one. I cut two butterfly shapes and sandwiched some thin wire between them, first taping it down and then gluing the butterflies together, right sides out. Then I took some gold and brown paint and did a little texturing on the paper to make the butterfly look slightly more realistic. It still looks a little clunky, but it’s close enough. 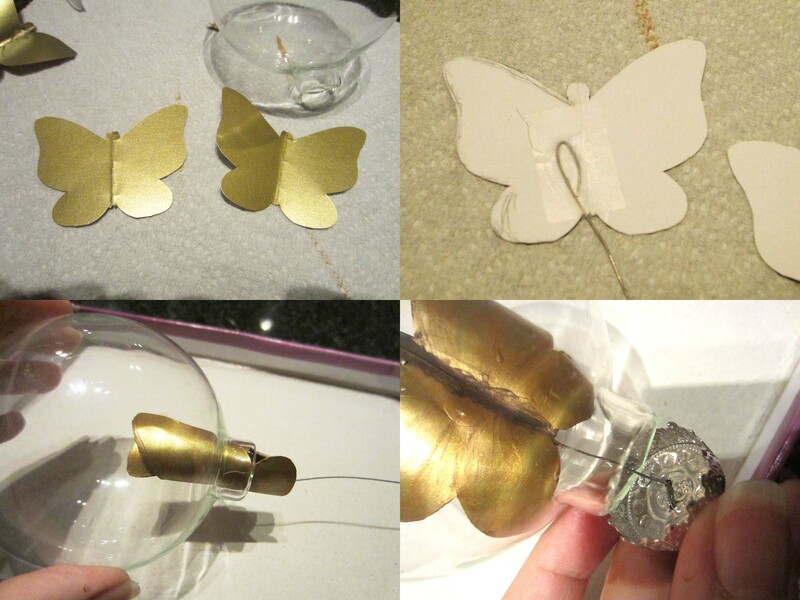 I rolled the wings up and inserted the wired butterfly into the glass ornament, then used my fingers and a chopstick to unroll the wings. I ran the wire through the holes in the top of the ornament cap and twisted it to keep things securely in place. I also piped on some hot glue as extra insurance.. I turned the whole thing upside down and presto– instant butterfly bubble! Stay tuned for photos from the convention!